Members of the “Plataforma de Afectador por la Hípoteca” in Lanzarote. Credit: PAH. All rights reserved. When she was unable to pay the mortgage on her house in Lanzarote, Christina was forced to occupy another, where she was beaten in front of her daughter by police who threatened her with jail. 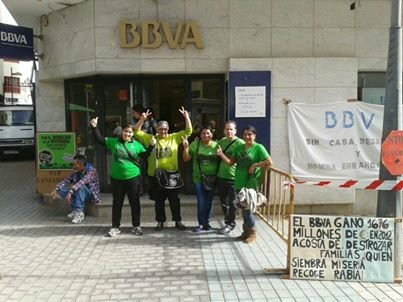 But she stayed on, and helped to form a local group that’s part of growing movement in Spain against eviction and foreclosure. It’s called the “Plataforma de Afectador por la Hípoteca” or PAH. Strongly connected to other movements like 15M, PAH is a movement that exemplifies a different, non-hierarchical way of organizing for social change. It’s helping thousands of people, not just to defend their housing rights together, but to transform the way they feel about themselves. I went outside and told them that I am not a criminal - that being poor is not a crime. It was then that they beat me. That is when my youngest daughter asked how they can value cement more than our lives. I continue to occupy a home in Lanzarote. I was born in the 15M. My daughter and I were part of the encampment here, and for me there was a before and an after. And yes, I fight now for my house and the issue of housing because I had participated in the 15M - clearly. It was because of this I fought and knew to call the PAH and see how to set up a group here in Lanzarote. When we first started organizing, people in the town came up to me all the time and said, “we don’t do that here, we don’t protest” and, well, now we do. I was evicted on the 20th of September 2013 for not being able to pay my mortgage. But really, it was a mortgage already paid, almost twice over. I heard about the PAH through the husband of a friend of my mother. He had seen something on the internet and so I found the number and called. I was called back and they said they would help, but then I did not go because, you know, sometimes you are not conscious until the very last moment. Then, when I was totally desperate I went and thank god they were willing to help me. And now, whenever there is anyone who needs help, I am there to support them. My situation was that I had bought my house for 36,000 Euros (then in pesetas) fifteen years ago, and by the time this situation started I had already paid 100,000 on the mortgage over the years. But, in the last three years I have had a hard time economically and have not been able to pay the full amount each month. The PAH went to a judge to stop the eviction, but they refused. So, they came to help defend my home for me and my children. When the police came there were lots of people from the PAH as well as some of my neighbors in front of the house, surrounding it, but the police violently arrested people and locked me out. Later I went back, and with the support of the neighbors and the PAH now I am occupying my own house again. The neighbors really helped a lot, not only by being dragged away by the police while defending my home, but also by giving me electricity and the tools to move back in. The woman below now has PAH posters on her balcony. The Lanzarote platform is similar to other groups throughout Spain: mostly composed of women and those who are directly impacted by the housing crisis. They organize horizontally and they don’t believe in hierarchy, making decisions through their weekly assembly. They use direct action techniques, rooting their organizing in trust, mutual care and affect. There are no hierarchies. They don’t exist. But it is not that they don’t exist because someone suggested it, but because it is a space where each person becomes the owner of their life and everyone has every opportunity. If we are all in control of our lives and we have all the opportunities there is no desire for someone to come and tell you what to do. The objective is that you have all the tools, all the capacity and opportunity to seek freedom and the freedom of all – so of course, hierarchy does not fit, and we don’t feel it, or want it ever. Each of the women I talked with emphasized that they are not alone in these feelings. The importance of the PAH is not only that it tries to keep everyone housed with some dignity, but that it changes the way people feel about themselves. Each person spoke of feeling more dignified, and no longer ashamed. Many other countries have movements that are similar to the PAH, with their roots buried deep in prior experiences of organizing. In Italy during November 2013, for example, hundreds of homeless families took over empty schools and other buildings in towns and cities such as Rome, Palermo, Naples, Milan and Turin. In urban areas of Germany like Berlin, neighbors not only organize to help prevent evictions, but if they are unsuccessful then they make sure through direct action that the homes affected are not rented out to others. Tactics have included preventing the showing of houses to prospective tenants, and putting glue into locks on the doors. If that still doesn’t work and a home is rented out, then activists use social and political pressure, such as explaining to potential renters that the neighborhood is opposed to their moving in. In the United States, dozens of groups are also organizing around housing in these ways. Some, like Occupy Homes, are direct spin-offs from Occupy. They are organizing neighbors to defend homes that are at risk of foreclosure physically. Often the result is that the banks involved do not go forward with the eviction, and the groups can then help the affected families to renegotiate their mortgages. Others, like the community-based groups that are based in poverty-stricken neighborhoods of Chicago, take over abandoned homes but state that they are going to do so publicly in advance, in order to build more publicity and support. There are also numerous groups that disrupt the auctions of homes that are about to be foreclosed. Actions range from singing in courtrooms in the boroughs of New York City, to the San Francisco Bay area, where activists have disrupted auctions that take place on the steps of City Hall. This usually implies many months of delays due to the backlogs involved, thus allowing more time for people to mobilize in defense of their homes. “Homes” means more than bricks and mortar. The actions of all these groups go much further than protecting the housing rights of vulnerable people. They also build new relationships and a different sense of self and of community, rooted in the strength and solidarity of collective action.